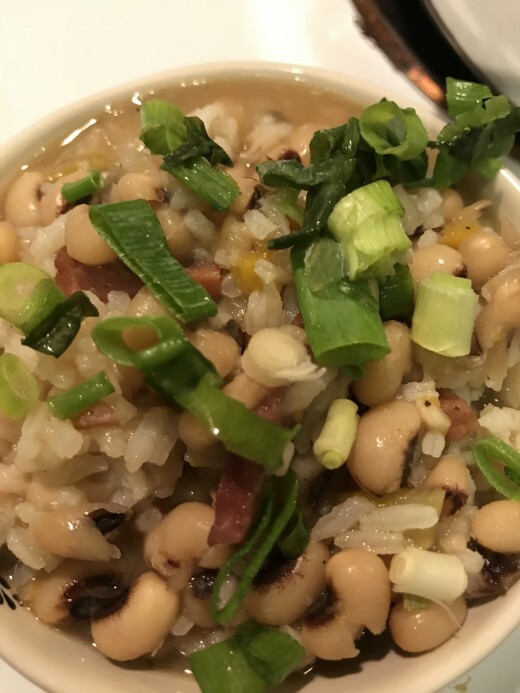 Hoppin John Recipe - Traditional Recipe for New Year's Good Luck! For centuries folks throughout West Africa and Western Europe have eaten similar dishes to bring luck and prosperity throughout a new year. This is the Southern version - and it's delicious! Folklore in the South says that if you eat Hoppin' John the day after New Year's Day, you call it Skippin' Jenny, and it signifies even greater prosperity for the new year. Using leftovers shows that you are truly frugal, and therefore you'll make the most of your resources and they'll multiply. I just like the names of these dishes - Hoppin' John and Skippin' Jenny - they sound like the Uncle Remus tales I grew up with - as though they are really, clever Bre'er Rabbit type characters! New Year's at my house wouldn't be right without black eyed peas - and I'm not alone in this. Throughout the South New Year's Day tables contain these wonderful little lovelies, and usually they are served up in a recipe of Hoppin' John. Many cultures consider beans to be lucky at the New Year, mainly because they resemble coins, and served alongside some sort of green they look like coins accompanying folded bills. Eating these foods at the New Year means prosperity and wealth coming - not a bad thing any day. I'm not entirely sure it works, but since it's delicious, it certainly won't hurt anything! Another story about Hoppin John on New Year's hark back to the Civil War when the residents of Vicksburg, Mississippi found themselves blockaded by the Union forces. Nearly starving, they discovered a stash of black eyed peas - lucky indeed. They've been considered a lucky food by Southerners ever since, although their resemblance to coins probably led to the association with New Year's Day as well. I'd certainly consider finding an unexpected stash of beans lucky, and I feed almost as many people as populate Vicksburg, so I'll go along with that one. Hoppin John Soup or Hoppin John Salad? 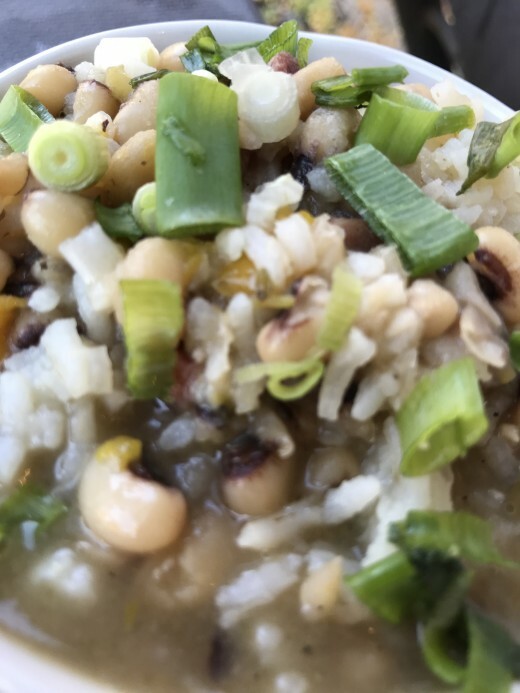 Are you looking for Hoppin John soup? Or perhaps Hoppin John salad? Guess what? They are nearly identical. The only difference is the amount of liquid - or 'pot liquor' that is served with the dish. If you want the salad version, carefully add only enough water as the beans can absorb during cooking. If you want the soup then add more liquid, just make sure to adjust the seasonings to account for the added liquid. In parts of France and Spain, consuming beans was considered lucky as far back as the Middle Ages, most likely due to the same resemblance to coins mentioned earlier. 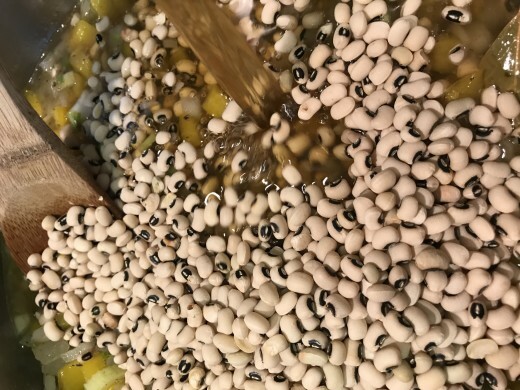 In the American South, the luck associated with black eyed peas from Africa became associated with this same tradition, and a new tradition was born. Hoppin' John history includes the merging of European and African food folklore. Cool, huh? Heat oil in a large soup pot or Dutch Oven, add the ham hock and sear on all sides for 4 minutes. Add the onion, celery, green pepper, and garlic and cook for 4 minutes. Add the black-eyed peas, stock, bay leaves, thyme, and seasonings. Bring to a boil, reduce the heat and simmer for 40 minutes, or until the peas are creamy and tender, stirring occasionally. If too much of the liquid evaporates, add more water or stock. Gently mix in cooked white rice. Taste and adjust for seasonings. Serve hot or cold, garnished with green onions and chopped crispy bacon. Note: If you want a Hoppin John Salad instead of a Hoppin John soup, then drain the liquid from the beans and vegetables before folding in the cooked rice. Serve the salad hot or cold. This recipe is very relaxed and forgiving, and there are as many variations for it as there are people in the South. The beans are necessary, and the rice. But that's the only really common two elements. There are, however, some other ingredients that are added or served with Hoppin John that you many want to try. In my Appalachian South, turnip greens are served with the black eyed peas to represent the green of folding money. Other places use collards, spinach, kale or cabbage - so you have your choice of delicious variations on that particular theme. Good Southern cornbread - which is the color of gold and therefore thought to be lucky as well - is nearly a requirement too. Some cooks make the beans and rice separately, then mix them to serve. Other variations have the dish cooked in one pot. There are recipes for slow cooker Hoppin John (which is easy - just throw the ingredients in and hit low for four hours), and other Hoppin John recipes that are done on the stove top or in a Dutch oven. Most call for pork of some kind - pork is considered lucky because pigs root forward - meaning the New Year will be a time to move forward and make progress. And of course, pork is yummy. 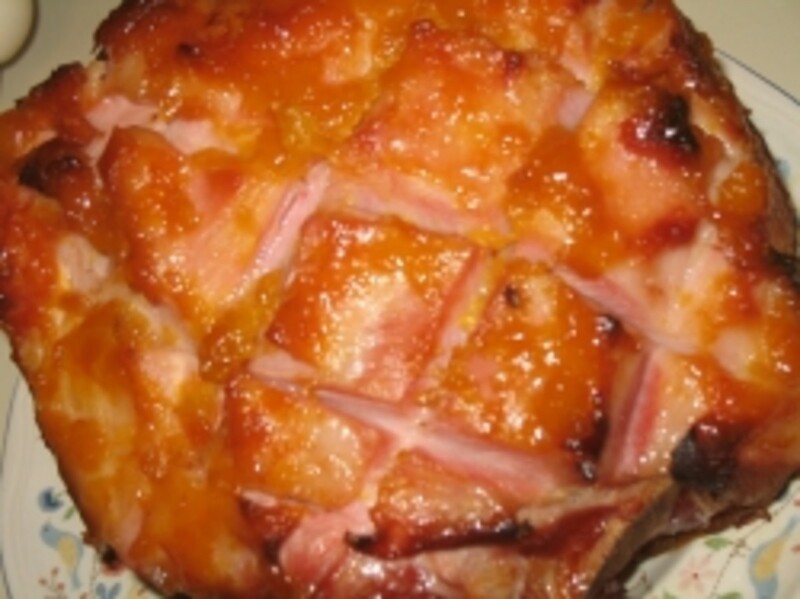 Ham hocks, bacon or sausage can all be used. Or in my case, I'll go doubles on the luck and use two of the three. Why skimp? It's New Year's after all. You know the fun part? 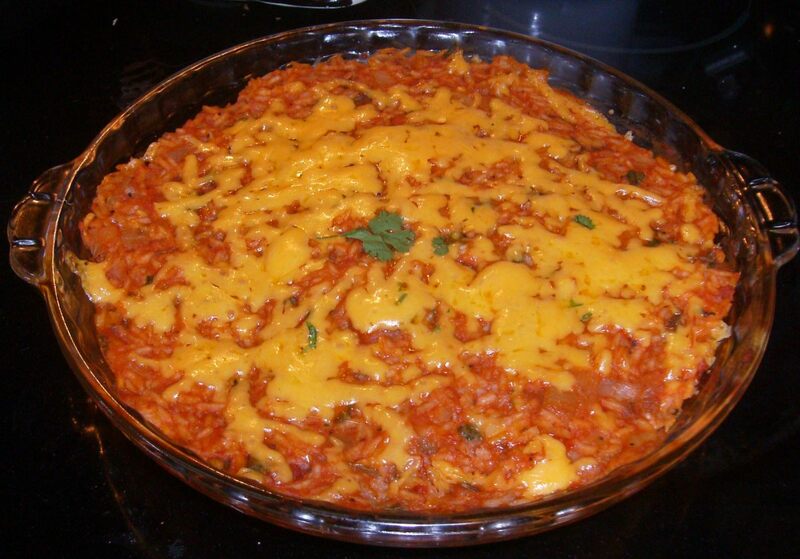 Other than this dish is one of the most economical and nutritious ones I know? Is that you can tailor the tradition to fit your fancy. Like black beans? Then try Hoppin Juan - make the dish using Cuban black beans or try Carribbean Black Beans and Rice. Go for a Brazilian twist and use black turtle beans. Or red beans if you favor the culture of New Orleans. You can go with leaving three beans on your plate on New Year's Day - to symbolize luck, prosperity and romance. Or you can count the beans in your serving - which is supposed to boost the wealth in the coming year. Or give a twist to the Spanish custom of eating one grape for each stroke of the clock at midnight, and eat 12 black eyed peas as you count down. No matter what you decide, you're going to have a delicious, nutritious and easy meal on your table for New Year's. If you ask me, that right there is a pretty fabulous way to start the year. 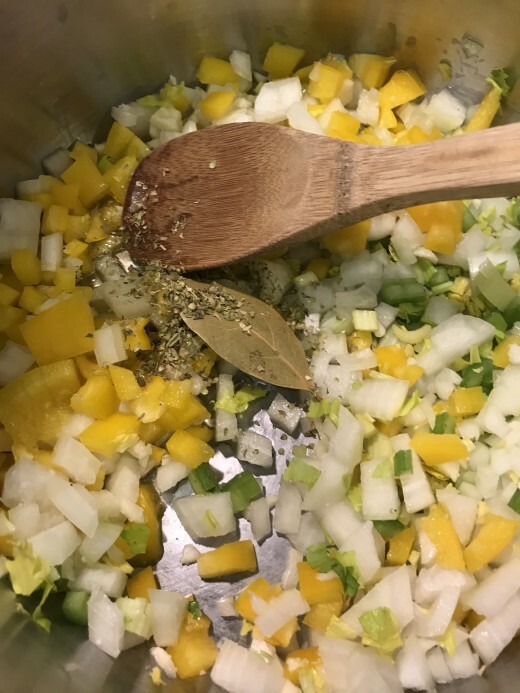 Onion, celery and bell pepper - the Cajun Trinity - starts the flavor base of this dish. Throw in some garlic, bay leaf, thyme, salt, pepper and red pepper flakes and you're good to go! Dried or Canned Black Eyed Peas? Canned beans are high quality and I use them all the time. But I love how letting the dried beans cook in the flavorful liquid allows them to really soak up the other flavors, making a richer, more cohesive dish. You can use chicken broth of course. 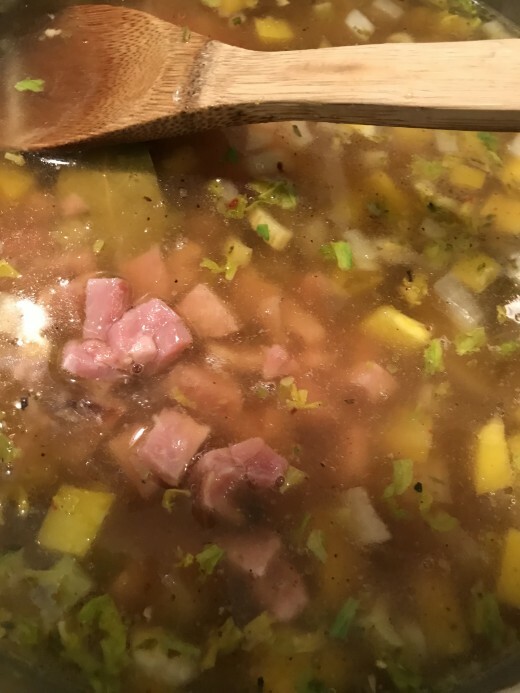 But if you have a chance, use ham broth, or at the very least use a good sized ham hock in your Hoppin John. Add bacon or diced ham - whatever you prefer. Or both! Top your Hoppin John with a little diced green onion and it's ready to serve. This dish stores well in the fridge and is just as good hot or cold. I've heard of that! It's lucky to get the dime, right? How fun! I may update to include that if you don't mind being the source? This is an awesome Hub - useful and interesting too! In my part of The South, we put (sanitized) dimes into the Hoppin Johns for extra good luck! and served with collards. Yum! Thanks for sharing the recipes and the history. Your recipe for Hoppin' John sounds delicious. Beans are a frugal meal and so nutritious at the same time. It does seem a good way to bring in the new year.